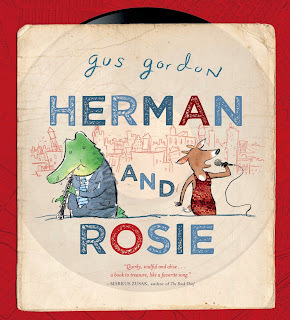 It's been a while since I've reviewed a Big Apple book (insert big ol' sad face here), and I'm hoping that with Gus Gordon's HERMAN AND ROSIE, I'll be back in the swing of things. Let me say simply that I adore this book... a completely sweet tale that's as much a love song to New York as anything else, Herman and Rosie are just two talented animals trying to pursue their dreams in NYC. A musician and singer respectively, they work hard just so they can have a little time once a week to do what they really love. When times get tough, they take to walking the streets of Manhattan before ultimately finding each other. Beautifully and whimsically illustrated, Gordon captures what it is to have a dream and refuse to give up on it. Also, I love that sometimes the one you love can live right under your nose. NYC is mysterious and wonderful like that... even if you're a crocodile or a deer (insert happy face here).